Welcome to our website here at the Unitarian Universalist Congregation. I’m glad you are checking us out online. When I went in search for my first ministry, I described the kind of congregation I hoped to serve. A congregation that loves to worship together, worship created through collaboration that integrates words, music, rituals, and silence to create an experience that speaks to hearts and minds and spirits. A congregation in which every member of the community can find a role that helps them connect more deeply, where they can discern and develop their gifts. A congregation in which faith development spans the generations. Where children and youth learn how to be religious people by regularly joining the adults in Sunday services, and adults learn more about their own beliefs by sharing them with children and youth. 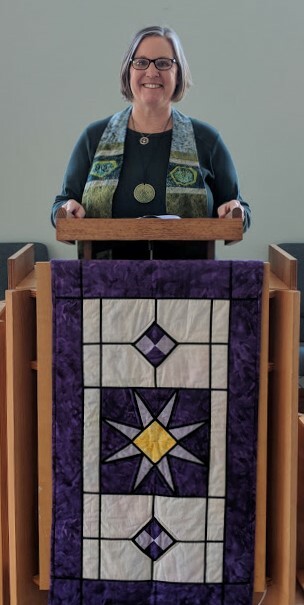 A congregation that considers itself part of the Unitarian Universalist movement—with members attending denominational gatherings, taking advantage of UUA resources, and being in relationship with nearby UU congregations. A congregation that is willing to work through difficulties, secure in a covenantal relationship that recognizes that while we will all try our best, we will sometimes fall short. A congregation that reaches outside its walls to the larger community, helping bend the moral arc of the universe toward justice. Having practiced creating beloved community with each other, we can take those skills and values out to the wider world. I want ours to be a congregation that is known for showing up. A congregation that believes in the transformative power of Unitarian Universalism. Looking back on my “dream list”, I realize that the UUC comes closer than I could have imagined. But we’re not perfect, and we’re looking for people to join us in fulfilling our mission to inspire, create, and transform. I invite you to consider what you are looking for in a spiritual community and whether UUC might be the place where you can continue on your spiritual journey. I encourage you to visit us on Sunday morning or contact me if you have any questions. Looking forward to meeting and getting to know you! Rev. Pam was installed as our settled minister on April 15, 2018. Click here for photos of the celebration.